The two things I remember most about my grandma are that she had a beautiful devotion to the Rosary and she spent a great deal of time knitting. She probably prayed and knitted at the same time! Her knitting was really a ministry of sorts. She made sweaters, hats, mittens and more all year long, and then donated them to the missions. She gave away most of what she made. How beautiful! I remember asking her once to teach me how to knit. I was probably only seven or eight years old, and let’s just say that my lesson didn’t last long. I’m not sure if it was she or I who didn’t have the patience—maybe it was both of us! Nevertheless, I always admired her skill and talent, and loved just sitting with her, watching her work and chatting away about all sorts of things. As a custom, Grandma knitted an afghan for each of her grandchildren’s high school graduation present. I remember going to the store with her to pick out yarn, even though my graduation was several years away. My grandma died before she finished my afghan, so my cousin was kind enough to finish it on her behalf. It is one of my favorite possessions, because her hands touched and blessed it. Six years ago, I decided to give knitting another try. My friend Anna was kind enough to give me a knitting lesson. And while my knitting wasn’t all that great, I was indeed knitting! I ended up taking an introductory knitting class at a local yarn shop to really get the hang of the basic stitches. And from that moment on, I was hooked! I discovered the enjoyment of the rhythm of the knitting and purling, back and forth. It relaxed me, as I listened to my iPod and sipped on a cup of tea. In a pretty short amount of time, I improved to the point that I could make scarves, hats, and other items for my family. Knitting also rekindled my connection with Grandma. I think she would be pleased that hobbies like knitting are so popular again. It’s like a link to the past, a way to preserve it and to connect with it. Shortly after my knitting took off, I became reacquainted with Our Blessed Mother. 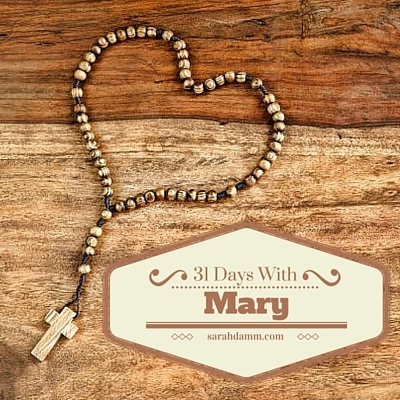 Over the last few years, my relationship with Mary has become more personal and real—from placing a statue of “The Kitchen Madonna” in my window sill, to planting a Mary garden in our backyard, to eventually making a consecration to Jesus through Mary in 2012. Through Our Blessed Mother, I again felt a renewed connection to my grandma. These two women—both named Mary—are my spiritual mothers. They are taking care of me through their prayerful intercession. They have gone before me, but they are still with me. I am so grateful for our Catholic belief in the communion of saints. It gives us a very real and tangible connection between those of us on earth, those “who have died and [are]being purified, [and those]in glory, contemplating ‘in full light, God himself triune and one, exactly as he is’” (CCC 954). “For all, indeed, who are of Christ and who have his Spirit form one Church and in Christ cleave together” (LG 49; Eph 4:16). This truth, that our brothers and sisters in Christ, who have died, continue to remain connected to us is a great comfort. It gives us the opportunity to pray for those still being purified, and it gives our saintly friends the opportunity to help us greatly through their intercession. Like St. Therese, they can spend their Heaven doing good on earth. 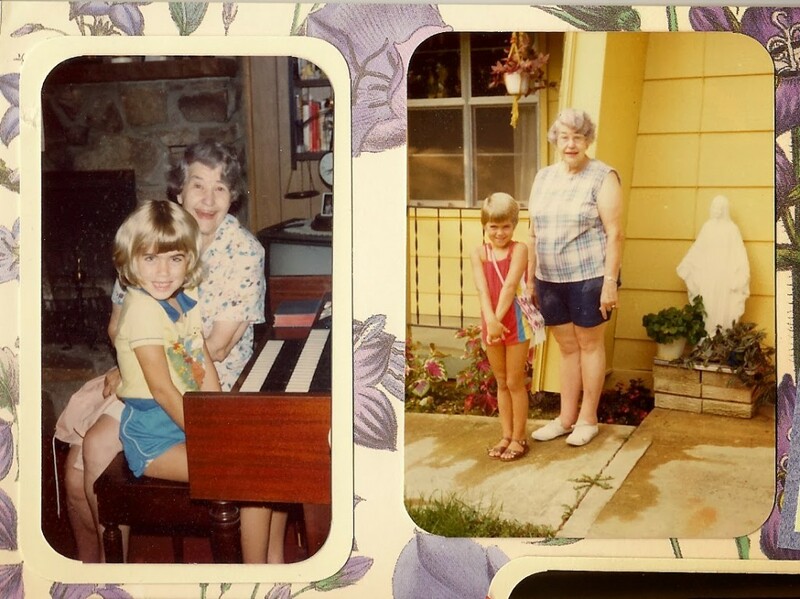 Even though it has been nearly 26 years since Grandma passed away, I miss her deeply and think about her daily. I know that as I follow in my grandma’s footsteps as a mother of six, a knitter and someone who has a great devotion to Our Blessed Mother, she is praying for me. And I hope that one day I may follow in her footsteps all the way to Heaven. This was originally posted on Jan. 9, 2014, on CatholicMom.com.